In this article, we’re going to look at managing user authentication in the MEAN stack. We’ll use the most common MEAN architecture of having an Angular single-page app using a REST API built with Node, Express and MongoDB. change output to the screen depending on logged in status (e.g. a “login” button or a “my profile” button). Before we dive into the code, let’s take a few minutes for a high-level look at how authentication is going to work in the MEAN stack. So what does authentication look like in the MEAN stack? the Angular application passes the JWT back to Express when calling protected API routes. JWTs are preferred over cookies for maintaining the session state in the browser. Cookies are better for maintaining state when using a server-side application. The code for this article is available on GitHub. To run the application, you’ll need to have Node.js installed, along with MongoDB. (For instructions on how to install, please refer to Mongo’s official documentation — Windows, Linux, macOS). The profile page will only be accessible to authenticated users. All the files for the Angular app are in a folder inside the Angular CLI app called /client. We’ll use the Angular CLI for building and running the local server. If you’re unfamiliar with the Angular CLI, refer to the Angular 2 Tutorial: Create a CRUD App with Angular CLI to get started. /api/profile/USERID (GET) — to return profile details when given a USERID. Okay, let’s get on with the code, starting with the database. Saving user passwords is a big no-no. Should a hacker get a copy of your database, you want to make sure they can’t use it to log in to accounts. This is where the hash and salt come in. The salt is a string of characters unique to each user. The hash is created by combining the password provided by the user and the salt, and then applying one-way encryption. As the hash can’t be decrypted, the only way to authenticate a user is to take the password, combine it with the salt and encrypt it again. If the output of this matches the hash, the password must have been correct. To do the setting and the checking of the password, we can use Mongoose schema methods. These are essentially functions that you add to the schema. They’ll both make use of the Node.js crypto module. Nothing needs installing, as crypto ships as part of Node. Crypto itself has several methods; we’re interested in randomBytes to create the random salt and pbkdf2Sync to create the hash (there’s much more about Crypto in the Node.js API docs). We’ll use this method when creating a user. Instead of saving the password to a password path, we’ll be able to pass it to the setPassword function to set the salt and hash paths in the user document. Checking the password is a similar process, but we already have the salt from the Mongoose model. This time we just want to encrypt the salt and the password and see if the output matches the stored hash. One more thing the Mongoose model needs to be able to do is generate a JWT, so that the API can send it out as a response. A Mongoose method is ideal here too, as it means we can keep the code in one place and call it whenever needed. We’ll need to call it when a user registers and when a user logs in. }, "MY_SECRET"); // DO NOT KEEP YOUR SECRET IN THE CODE! Note: It’s important that your secret is kept safe: only the originating server should know what it is. It’s best practice to set the secret as an environment variable, and not have it in the source code, especially if your code is stored in version control somewhere. That’s everything we need to do with the database. Passport is a Node module that simplifies the process of handling authentication in Express. It provides a common gateway to work with many different authentication “strategies”, such as logging in with Facebook, Twitter or Oauth. The strategy we’ll use is called “local”, as it uses a username and password stored locally. 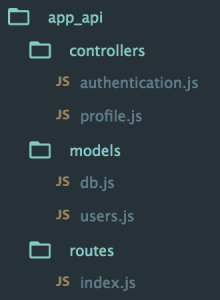 Inside the api folder, create a new folder config and create a file in there called passport.js. This is where we define the strategy. For a local strategy, we essentially just need to write a Mongoose query on the User model. This query should find a user with the email address specified, and then call the validPassword method to see if the hashes match. Pretty simple. There’s just one curiosity of Passport to deal with. Internally, the local strategy for Passport expects two pieces of data called username and password. However, we’re using email as our unique identifier, not username. This can be configured in an options object with a usernameField property in the strategy definition. After that, it’s over to the Mongoose query. Note how the validPassword schema method is called directly on the user instance. Now Passport just needs to be added to the application. So in app.js we need to require the Passport module, require the Passport config and initialize Passport as middleware. The placement of all of these items inside app.js is quite important, as they need to fit into a certain sequence. The config should be required after the model is required, as the config references the model. Finally, Passport should be initialized as Express middleware just before the API routes are added, as these routes are the first time that Passport will be used. We’ve now got the schema and Passport set up. Next, it’s time to put these to use in the routes and controllers of the API. secure the /api/profile route so that only authenticated users can access it. send the JWT inside the JSON response. This makes use of the setPassword and generateJwt methods we created in the Mongoose schema definition. See how having that code in the schema makes this controller really easy to read and understand. Don’t forget that, in reality, this code would have a number of error traps, validating form inputs and catching errors in the save function. They’re omitted here to highlight the main functionality of the code. The login controller hands over pretty much all control to Passport, although you could (and should) add some validation beforehand to check that the required fields have been sent. The final thing to do in the back end is make sure that only authenticated users can access the /api/profile route. The way to validate a request is to ensure that the JWT sent with it is genuine, by using the secret again. This is why you should keep it a secret and not in the code. Again, don’t keep the secret in the code! In this example, we only want people to be able to view their own profiles, so we get the user ID from the JWT and use it in a Mongoose query. "message" : "UnauthorizedError: private profile"
Naturally, this should be fleshed out with some more error trapping — for example, if the user isn’t found — but this snippet is kept brief to demonstrate the key points of the approach. That’s it for the back end. The database is configured, we have API endpoints for registering and logging in that generate and return a JWT, and also a protected route. On to the front end! getting the details of the logged-in user from the JWT. We’ll need to create a new service called AuthenticationService. With the CLI, this can be done by running ng generate service authentication, and making sure it’s listed in the app module providers. In the example app, this is in the file /client/src/app/authentication.service.ts. To keep a user logged in between visits, we use localStorage in the browser to save the JWT. An alternative is to use sessionStorage, which will only keep the token during the current browser session. This service uses the HttpClient service from Angular to make HTTP requests to our server application (which we’ll use in a moment) and the Router service to navigate programmatically. We must inject them into our service constructor. Then we define four methods that interact with the JWT token. We implement saveToken to handle storing the token into localStorage and onto the token property, a getToken method to retrieve the token from localStorage or from the token property, and a logout function that removes the JWT token from memory and redirects to the home page. It’s important to note that this code doesn’t run if you’re using server-side rendering, because APIs like localStorage and window.atob aren’t available, and there are details about solutions to address server-side rendering in the Angular documentation. Now let’s add a method to check for this token — and the validity of the token — to find out if the visitor is logged in. So how do you read a JWT? Signature — an encrypted hash of the header and payload, using the “secret” set on the server. It’s the second part we’re interested in here — the payload. Note that this is encoded rather than encrypted, meaning that we can decode it. There’s a function called atob() that’s native to modern browsers, and which will decode a Base64 string like this. So we need to get the second part of the token, decode it and parse it as JSON. Then we can check that the expiry date hasn’t passed. The user details that are provided include the information about the user’s name, email, and the expiration of the token, which we’ll use to check if the user session is valid. If the token exists, the method will return if the user is logged in as a boolean value. Now we can construct our HTTP requests to load data, using the token for authorization. It does require the map operator from RxJS in order to intercept and store the token in the service if it’s returned by an API login or register call. Now we can implement the public methods to call the API. Each method returns an observable that will handle the HTTP request for one of the API calls we need to make. That finalizes the service; now to tie everything together in the Angular app. call the protected /api/profile API route. We’ll begin by looking at the register and login forms. The first task in the controller is to ensure our AuthenticationService and the Router are injected and available through the constructor. Next, inside the register handler for the form submit, make a call to auth.register, passing it the credentials from the form. The register method returns an observable, which we need to subscribe to in order to trigger the request. The observable will emit success or failure, and if someone has successfully registered, we’ll set the application to redirect them to the profile page or log the error in the console. Once again, we have the form submit handler, and NgModel attributes for each of the inputs. In the controller, we want the same functionality as the register controller, but this time called the login method of the AuthenticationService. Now users can register and sign in to the application. Note that, again, there should be more validation in the forms to ensure that all required fields are filled before submitting. These examples are kept to the bare minimum to highlight the main functionality. In the navigation, we want to show the Sign in link if a user isn’t logged in, and their username with a link to the profile page if they are logged in. The navbar is found in the App component. That’s pretty simple, right? Now, in the associated template we can use auth.isLoggedIn() to determine whether to display the sign-in link or the profile link. 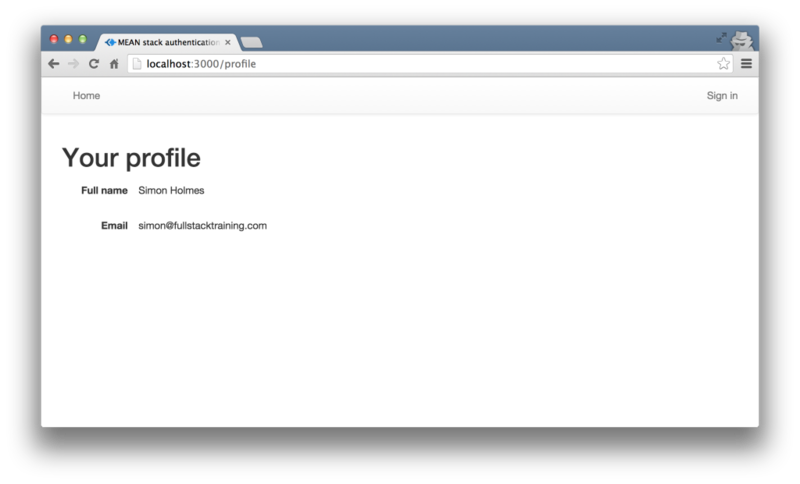 To add the user’s name to the profile link, we can access the name property of auth.getUserDetails()?.name. Remember that this is getting the data from the JWT. The ?. operator is a special way to access a property on an object that may be undefined, without throwing an error. In this step, we’ll see how to make a route accessible only to logged-in users, by protecting the /profile path. Angular allows you to define a route guard, which can run a check at several points of the routing life cycle to determine if the route can be loaded. 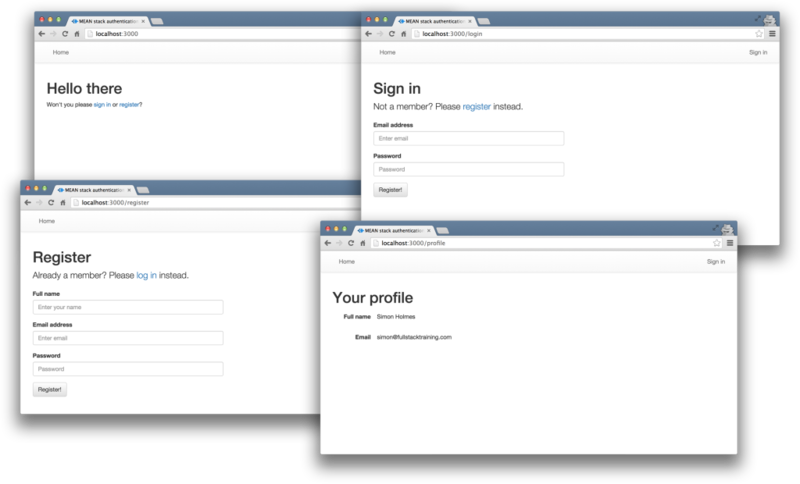 We’ll use the CanActivate hook to tell Angular to load the profile route only if the user is logged in. With that route guard in place, now if an unauthenticated user tries to visit the profile page, Angular will cancel the route change and redirect to the home page, thus protecting it from unauthenticated users. The /api/profile route has been set up to check for a JWT in the request. Otherwise, it will return a 401 unauthorized error. To pass the token to the API, it needs to be sent through as a header on the request, called Authorization. The following snippet shows the main data service function, and the format required to send the token. The AuthenticationService already handles this, but you can find this in /client/src/app/authentication.service.ts. Remember that the back-end code is validating that the token is genuine when the request is made, by using the secret known only to the issuing server. To make use of this in the profile page, we just need to update the controller, in /client/src/app/profile/profile.component.ts in the sample app. This will populate a details property when the API returns some data, which should match the UserDetails interface. Then, of course, it’s just a case of updating the bindings in the view (/client/src/app/profile/profile.component.html). Again, the ?. is a safety operator for binding properties that don’t exist on first render (since data has to load first). That’s how to manage authentication in the MEAN stack, from securing API routes and managing user details to working with JWTs and protecting routes. If you’ve implemented an authentication system like this in one of your own apps and have any tips, tricks, or advice, be sure to share them in the comments below! Jeremy is a Web Applications Architect with experience working for companies like eBay and Teradata. He is a Google Developer for Web Technologies, and has two books Ionic in Action and Angular 2 in Action.